My name is Mary Duncan. I have struggled with my weight as long as I can remember. Back in high school, I was about 170 pounds and my dress size was 12. Shortly after high school I met my husband and got married. Then I had my daughter. Three years after my daughter was born I had my son. And by that time I was tipping the scale of 202 pounds! So I decided to do something–to get up early and exercise. And that’s for six months! But I only lost a total of 12 pounds. I was extremely frustrated. The results were barely nonexistent after six long months of efforts. I gave up. Then my husband heard about HCG from someone and he told me about it. 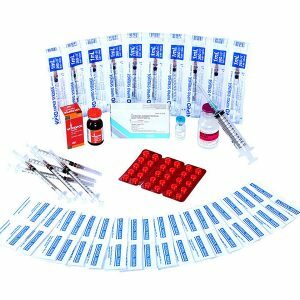 I search for HCG Diet on the website right away and found out about hcg-injections.com. Naturally, I was really skeptical at first. But the more I read about HCG Diet the more I became excited. I was telling myself “This is it. This won’t let me down”. I had this feeling that this time around I will get the results that I’ve always wanted. So I ordered HCG injections and I am very happy with the results. HCG has literally changed my life. I am so happy that I made the right decision in trying the HCG Diet. I have lost a total of 55 pounds for 7 months in the course of 2 rounds. Right now I am wearing a size 8 dress from size 16. I have never been this small in my entire life. I dropped a total of 8 dress sizes. Now I look amazing and it makes me feel great about it. I am even more confident now than I have ever been. This is who I am supposed to be. Big thanks to HCG!